Yes, with the Icom 7610 we have a 170 kHz wide spectrum with CW Skimmer! It’s a powerful CW tool for the Amateur Radio operator. The wide settings are a little different than the narrow (24 kHz) settings. Wide is very effective with something like DXLabs Spot Collector or the N1MM Logger+ Telnet Cluster. If you are a contestor, DX chaser or just looking for stations calling CQ, getting CW Skimmer (CWS) running at 170 kHz wide is a nice addition to any shack. This is all done very easily with the Icom 7610 using HDSDR. Have a look at the videos below. Before doing this, I setup everything as in the article: 24 kHz CW Skimmer with the Icom 7610. If you need help getting the Icom 7610 ready for CW Skimmer, see my first article Icom 7610 HDSDR and Icom I/Q Package. CWS Wide is not used entirely the same as 24 kHz (narrow) and we don’t see a full 170 kHz in CW Skimmer either. Unless you are viewing CW Skimmers (CWS) band scope. The new settings in HDSDR and CWS make CWS unusable for changing frequency on the radio and HDSDR. There is no rig control in CWS. Thus we use something like Spot Collector to pull spots from CWS and then we can quickly click on spots and change frequency to the spotted station. See how this works in the video below. There are only two changes in HDSDR. One is in the ExtIO settings and the other is to set the “Tune” frequency . See the video below. An easy way to have HDSDR setup for SSB, CWS Narrow and CWS Wide is to use profiles in HDSDR. That way we don’t have to keep changing things when we go from SSB to CW. I made a short video on this. For 170 kHz wide in CWS use SoftRock for the Radio. The LO frequency in CWS is actually the “Tune” frequency set in HDSDR. Strange enough, but that’s the way it works. Enable Telnet in CWS too. In the document provided by Icom (link below) they show detailed instructions for configuring N1MM Logger+ to pull spots from your CW Skimmer. It’s very easy to do. I used the same setup with Spot Collector (DXLab Suite) and AC Log too. Using it in either program provides a powerful CW tool for Ham operators. 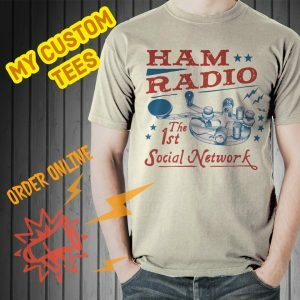 It did not work in the Ham Radio Deluxe DX Cluster software. DX Cluster will not display the spots. Maybe something can be done with this in the future. If you want help with N1MM Logger+ and configuring ports with the Icom 7610, I have a nice article here: Icom 7610 N1MM One Cable RTTY FSK CW – How To. 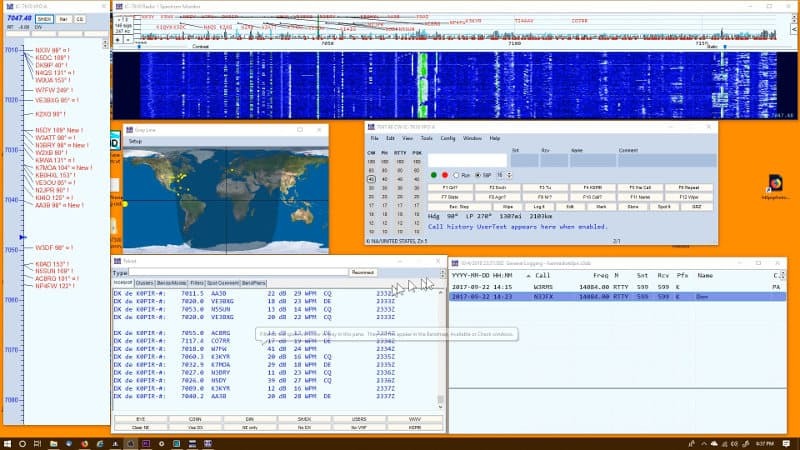 The video below shows changes made in HDSDR and CW Skimmer. You’ll also see how this works in N1MM Logger+, DXLab Suite SpotCollector and Amateur Contact Log. The 170 kHz wide spectrum is explained near the end. A big thanks to all the subscribers and everyone who posts questions and comments with ideas and suggestions. I sincerely appreciate it and hope this website helps Amateur Radio operators. I’m trying to use CWS with Fldigi and ACL and my 7300. I have both a USB Cable and CI-V cable. Do I need to use OMNIRig? Do I need to use the stereo cable from the 7300 phone jack to my computer sound card speaker jack also? I think I’ve read everything you’ve written about CWS and Pete Smith’s intro to CWS. Nice to hear from you and that sounds like a great setup you have going. Yes, I used Omnirig when I had HDSDR going with my 7300, so I would try it with CWS. You should not need a stereo cable. All audio is through the USB cable, the USB Audio CODEC. FWIW I never did try CWS with the 7300 and HDSDR, but I heard other Hams used it. A problem I’m having with the CWS Wide is that the spots from CWS to N1MM are off the actual frequency. For example: CWS reads the W1AW code practice transmission at 7047.5, but the CWS spot to N1MM is 7016.1. Clicking on W1AW in the band map tunes the radio to 7016.1 not 7047.5. Nice to hear from you. I have not run across that. It must be in the settings somewhere. What does it look like in HDSDR? If it’s off I would start there and check the settings. Solved the problem of the off frequency spots in wide mode by doing removing N1MM and CWS, doing a fresh install of both, and setting up only for CWS wide operation. I haven’t reloaded for narrow mode yet, but obviously I had some setting wrong when moving from narrow to wide. This may be helpful if anyone else encounters an issue. Thanks for reporting back and yes your experience will help others. It takes a little getting used too and I took it slow for a while by just running narrow before delving into wide. Nice to hear from you. I have a CI-V cable and it is connected to the CI-V port on the rear of the IC-7610. I am using it in CW Skimmer for OmniRig instead of the Kenwood and CAT to HDSDR. Nothing wrong with using the Kenwood and CAT to HDSDR, but I don’t care for the flashing frequency in CW Skimmer when using it. It comes up as my COM12 in my PC. I have a few of these cables I use on and off for various things. Nice to hear from you and great question. I believe so, because one or two of the updates required loading the settings back for me. If you save your settings prior to updating the firmware, you can load them back after the update. CWS and HDSDR I don’t know, but I would not think so. I updated my HDSDR and Omnirig without issue. What are you using the CIV port for? I’m still using version 1.03 on my IC-7610, if I upgrade to version 1.2 will I lose all my memory settings in the 7610??? Same question for CW skimmer and HDSDR??? ?